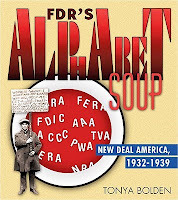 FDR's Alphabet Soup: New Deal America, 1932-1939 by Tonya Bolden. (Grades 5+) Knopf Books for Young Readers, 2010. Review copy provided by my local library. Herbert Hoover took the oath of office in 1929. Seven months later, the stock market crashed, plunging America into the Great Depression. Hoover was criticized for not providing relief. People even nicknamed shantytowns for the homeless, calling them Hoovervilles. In 1933, America was ready for a New Deal. Enter Franklin Delano Roosevelt. He not only had plans for rebuilding America, he took action and got it done. In FDR's Alphabet Soup, Tonya Bolden takes readers back in time to the 1930s to explore the many programs that FDR and his colleagues developed to combat the Depression. Called "alphabet soup" because of the many acronyms, FDR's programs included the WPA (Works Progress Administration), SBP (School Breakfast Program), and the FDIC (Federal Deposit Insurance Corporation), among many, many more. Thousands of people benefited from these programs. Thousands of people were enraged by things FDR did while president. Back in 2007 when I started this book, I told friends that I was seeing way too many parallels. Some thought me nuts, but I stuck with my gut, convinced that I was witnessing a paradigm shift. While so much history was repeating (or rhyming), I was even more committed to hooking young people up on history, so that they might have more understanding of their twenty-first century lives. I can't even tell you how timely this book is. Written in a conversational tone and including tons of photos and sidebars, it's far from a textbook. While the book certainly includes more than enough well-documented information to be a valuable resource for reports, Ms. Bolden wrote it with the aim of satisfying young history buffs and it succeeds on that front. This book will answer questions teens and tweens have about life in the 1930s and it may inspire them to do some more research on the decade. The book includes a glossary, list of sources, photo captions, and an index. You'll want this for library shelves. Pair it with Down Cut Shin Creek: The Pack Horse Librarians of Kentucky by Kathi Appelt for an in-depth look at one of FDR's programs. Happy Nonfiction Monday! This week's round up is over at Books Together - go check it out! Putting it on our to-order list for the library! In other news, I have an award for you on my blog!